Specifications: blades 24" on 9" spacing, 1 1/2" square gang rods, triple sealed bearings, 7.50 x 20 ribbed implement tires, 3 inch solid steel axle, 3" x 12" hydraulic cylinder. Sizes: 6'6" to 11'0". Weights: 3900 to 4800 pounds. Features: The heavy-duty version of the Model JJ, all gang and depth adjustments are the same as the JJ. 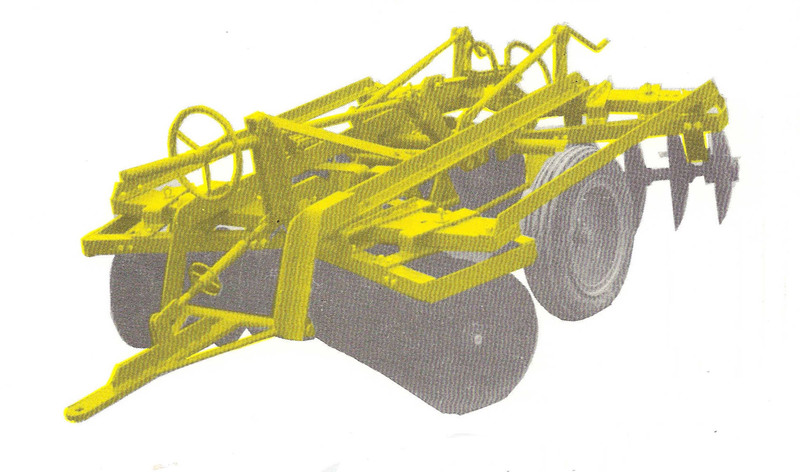 The main and gang frames are a combination of welded box and bolted heavy angle members, providing sufficient strength for use with higher horsepower tractors. Cast iron spools and heavy truck type wheels add to the ruggedness of this EXTRA HEAVY DUTY TANDEM.